So what does any of this have to do with the photo above? Well, not much really, but after so much travel, the fridge was rather on the empty side. And I wanted dinner, and I wanted it fast. And... it is spring, and I had just planted my basil. While I have a week or two yet before I can start harvesting fresh basil from my garden, I have plenty of frozen basil from last summer's harvest, which I use for stir fries. With frozen shrimp (my emergency protein stash), frozen peas, and frozen basil... my idea of a frozen dinner. You can buy these noodles in the fresh noodle section of Asian grocery stores. They're yellow and look a bit ramen noodle-ish. I don't know the "official" method for cooking. I've just played around and found something that works for me. I don't have exact amounts. I'm usually a "start with a recipe and modify from there" kind of chick, but this is one of those rare time when I just throw stuff in the pan until it looks right. Adjust amounts for the number of people you're serving. Heat a bit of oil in a small pan and pour in the beaten egg. Swirl the egg around to set it like a thin pancake. When the egg is set and cooked until golden, slide out onto a board. Let it get cool enough to handle, roll it up like a cigar, and cut into thin strips. Set aside. Heat a bit of oil in a saute or frying pan large enough to accomodate your noodles. You may need to gently pull the noodles apart so that they can be laid in the pan to create a nice round pancake-like shape. Add a bit of water to help soften the noodles. When they've browned on the bottom side, flip them over. If you're having trouble flipping them, here is a method: loosen them if necessary and slide noodles out on to a plate. Lay a second plate over the noodles (like a sandwich). Flip the plates over. Now you can slide the noodles back into the pan with the uncooked side down. Add a bit more water. Remove noodles from the pan when they've begun to brown. Watch out for hot spots where the noodles might burn! Heat some oil in a wok or another frying pan. Add garlic and/or ginger and fry for a few seconds; enough to release the aroma. Add shrimp and stir fry until, say, halfway done. Add peas and carrots and stir fry a bit more. Add oyster sauce — enough to make a nice amount of sauce, but not too gooey. Taste and add a bit of sugar to balance the saltiness, if desired. Add basil and green onion. If the oyster sauce is too runny for your tastes, add a bit of starch with water to thicken it up. In all this, try to avoid overcooking the shrimp. Pour shrimp on top of noodles. Top with the strips of egg. Serve immediately. In the U.S., summer means backyard BBQs and the ubiquitous cabbage-carrot cole slaw drowning in sauce. Joe and I both enjoy fresh slaw-like salads that defy Midwestern expectations. This one has a zingy dressing of coconut and garlic and hot chilies. Actually, the dressing is from an Urap recipe, which is not a slaw at all. Urap is an Indonesian (Javanese, specifically) dish of parboiled vegetables tossed in a coconut dressing. 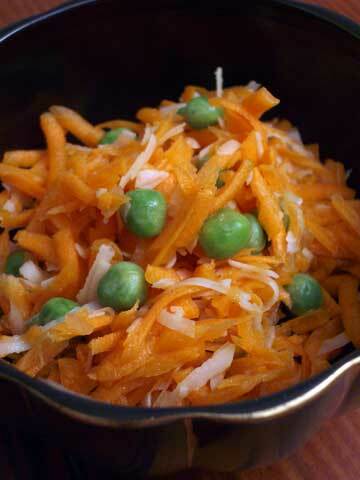 We discovered that the dressing works just wonderfully with shredded carrot and peas. I'd happily take this to a BBQ as a alternative to the usual American cabbage slaw. Grind garlic, onion, and chilies in a mortar (or in a blender) until smooth. In a bowl that can be heated in water, mix coconut with water, sugar, salt, and pepper, then stir in the garlic-onion sauce. Place this bowl in a larger pot of water. We put the bowl on a small steamer stand so that it wasn't touching the bottom of the pot. Bring the water to a boil, cover with a crack left open, and steam the coconut for about 20 minutes. 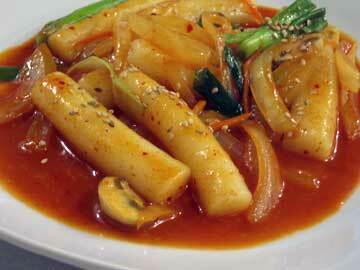 For dinner we stuck with basic dishes that would offer a good comparison to the Korean restaurants we've tried. Both entrees came with a light miso soup. (I suspect it's shiro miso, but I'm no expert.) Joe got the Bi Bim Bop in hot stone bowl. To my delight, it came with the egg still soft. At so many of the Korean diners around town (and Arirang is NOT a diner), when I order bi bim bop, the fried egg comes nearly hard — even when I ask for it soft. I ordered the bulgogi on a hot plate. It came with chili bean paste, rice, and lettuce for wrapping. I enjoyed its slightly sweet, grilled flavor. We were very pleased with our first experience at this family-run restaurant. I was impressed with both the freshness and flavors of their dishes, the friendly service, and clean pleasant atmosphere of their dining room. (And, bonus, their prices are more reasonable than Seoul Garden.) The only thing they could have possibly improved was to re-fill my tea cup more frequently. But it was only their second day, so they deserve kudos for handling the service and food preparation as well as they did with steady business coming in. Joe describes this salad as "oddly compelling." That's a pretty good description. This is not a salad that everyone will like, but it has a tangy flavor with bitter notes that goes well with those Thai curries that have a sweet taste to them like Masaman curry. The original recipe claims to feed 4-6, but I think it can feed far more than that. When I make it for just Joe and myself, I make about 1/4 the amount in the recipe. 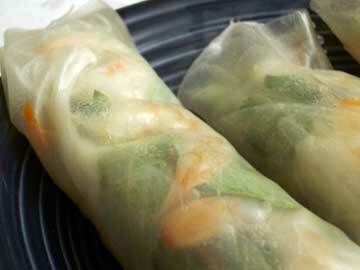 1) Make dressing — combine fish sauce, lime rind, lime juice, and coconut milk and set aside. 2) Heat oil in a pan and saute garlic, shallots, and peppers until shallots are crispy brown. Drain on a paper towel and set aside. 3) Blanch shredded cabbage for 2 -3 minutes. Drain and put in a bowl. 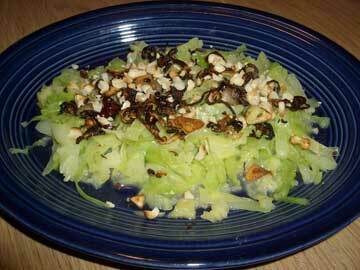 4) Toss dressing with cabbage. Transfer to a serving dish. Top with shallot mixture and peanuts. You can reduce the bitter note by sauting the shallots first until about half done, then add the garlic and peppers. This way the garlic won't brown too much and become bitter.